Did the Opioid Epidemic Help Donald Trump Win? 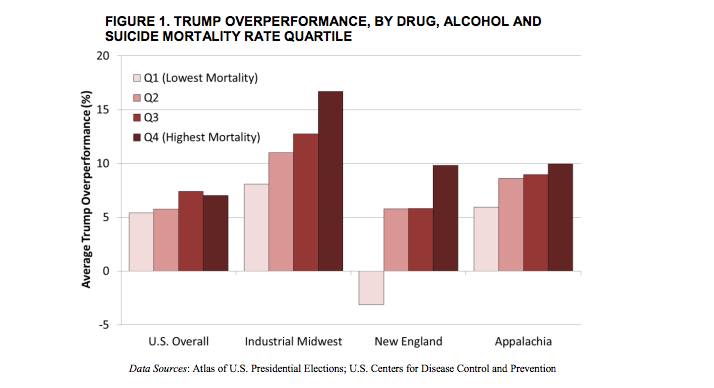 New research shows that Trump made huge gains in counties with the highest rates of death from drugs, alcohol, and suicide. Drug overdoses and drug-related diseases have killed nearly 400,000 people in the United States over the past decade—on par with the number of American soldiers who died during World War II. Nearly 400,000 others have committed suicide, while 250,000 died from liver disease and other alcohol-related illnesses. About a fifth of all of these deaths involved prescription painkillers or heroin. Together, these “deaths of despair” have been destructive enough to shorten the life span of a whole demographic group, namely middle-aged white people without college degrees. Beyond its devastating effect on families and communities, there is emerging evidence that this health crisis also has political repercussions. Consider Coos County, New Hampshire, which occupies the state’s northern tip and has the highest death rate from drugs, alcohol, and suicide in all of New England. It used to be reliably Democratic: Barack Obama won the county by nearly 20 percentage points in 2008 and again in 2012. But this year Donald Trump took it easily, by nearly 10 points. Still, economic decline in many of the counties that swung unexpectedly towards Trump predates the Obama administration. So does the surge in deaths of despair: Anne Case and Angus Deaton, Princeton economics professors who documented the trend, trace it back to the late 1990s. Sam Quinones, journalist and author of Dreamland: The True Tale of America’s Opiate Epidemic, notes that in southern Ohio Trump ran away with counties that Romney barely won, though employment has picked up in the last few years. That region was once the pill-mill capital of the country; since the last election, heroin (and media coverage of it) has spread, with deadly consequences. Even if that trauma is tied to decades-old economic trends, it feels new, its urgency unmatched by the sluggish response from politicians. Trump spoke to the concern about drugs and to racial anxieties in the same breath. In fact, many narcotic addictions and overdoses were, initially, homegrown—kick-started by prescription opioids relentlessly marketed by American pharmaceutical companies, who’ve profited handsomely. Building a wall won’t do anything to ease the demand that is already here. Overall, it’s unclear what Trump will do to improve public health in the communities that elected him (and in others: White middle America is hardly the only community facing acute health issues), particularly since Trump’s Republican colleagues in Congress have been reluctant to devote significant resources. Trump has said he’ll “spend the money” to expand treatment, but he hasn’t been specific about a plan to do so. Instead, his administration is poised, along with congressional Republicans, to make it much harder for people with addictions to get help. Since the Affordable Care Act was passed, 1.2 million people with substance-abuse disorders have gained insurance coverage for treatment through Medicaid. The expansion helped somewhat to make up for a decline in public-health funding in many states. 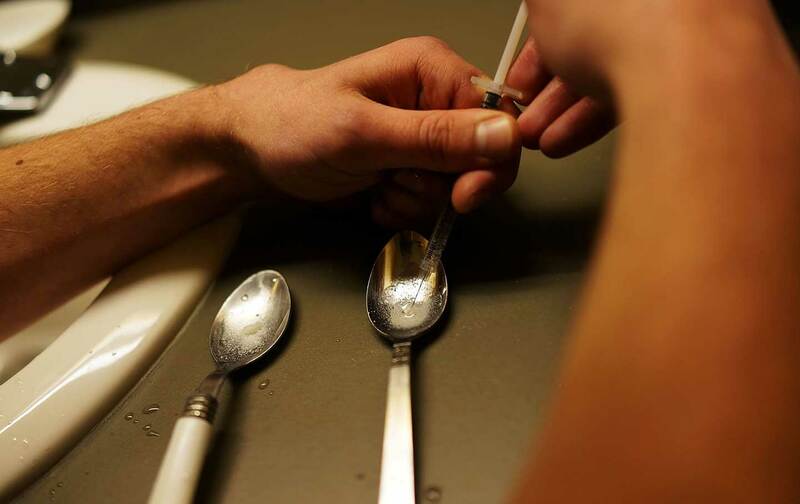 “It’s hard to convey how much worse things were before the Medicaid expansion,” the director of an addiction and mental illness treatment center in southern Ohio recently told The Columbus Dispatch. The health law also made it mandatory for private insurers to cover substance-abuse treatment. Trump, along with Representative Tom Price, his nominee to head the Department of Health and Human Services, has promised to repeal the health-care law. The replacement Price proposed does not require insurers to cover treatment for addiction. Monnat told me that deaths of despair originate in “a desire to escape pain, stress, shame, anxiety, and hopelessness.” Trump validated, amplified, and exploited all of those feelings. The open question is whether he has a real commitment to alleviating them.